This year we’re planning to run a series of posts highlighting some of the much loved and well used areas around the pond – the hotspots – such at Sandy Bay and the Picnic Area. We’ll also feature some hidden gems, including The Stew Ponds. In 1491, the Prior at Winchester leased Fleet Pond and its pastures to a tenant at Fleet Farm for an annual rent of 23 shillings and 4 pence, plus “a hundred of the fishes, pike, tenches, perches, bream and roaches, to be delivered to Winchester in a good and fresh state”. 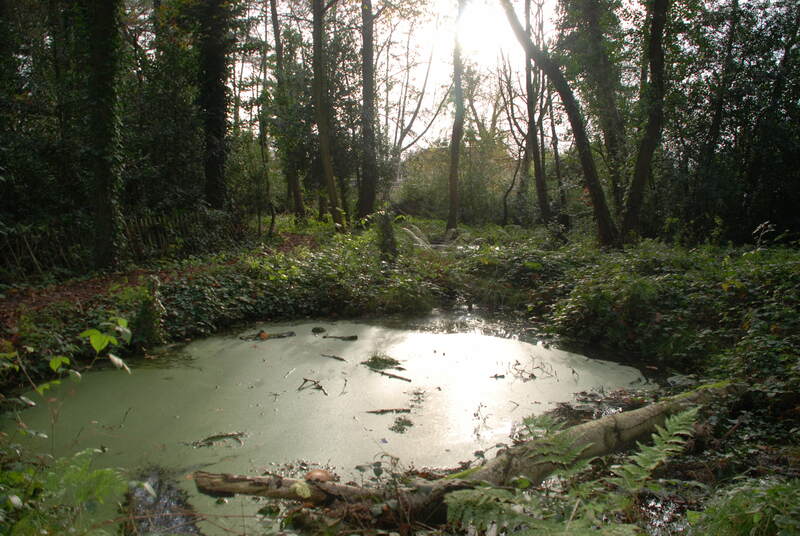 The stewing, or holding ponds, are thought to date back to this time and can be reached by following the colour coded posts on the blue walk, which detours away from the pond to circle Brookly Wood. The series of four, possibly five, small interlinking ponds are located in a glade alongside a footpath running off the Brookly Stream. It’s thought these ponds were built in order to store fish taken from the main pond and would have been used by the monks of St Swithins, and then by their tenants. Fresh fish could be taken from the stew ponds and housed in barrels, ready to be transported by cart to the Priory at Winchester. The regular conservation volunteers undertook the task of uncovering the ponds on their work parties in September and October 2006. Initially, we looked in vain for any water as the ponds blended into the woodland floor, covered by layers of leaves and plant debris. Our first task was to clear the holly and bramble from the surrounding area and fell some of the smaller trees, allowing more light to fall on the ponds. Tackling the larger pond was back-breaking work as years of accumulated muck and plant debris had to be shovelled upwards and over the bank into buckets and wheelbarrows. The deeper we dug the smellier it got as the waft of sulphur rose up from the murky depths. The three smaller ponds were much shallower than the larger one, and we were able to use large, wide-toothed rakes to haul the debris from these. I remember we were all secretly hoping to uncover a rare medieval artifact, but all we found were an assortment of mobile phones, a video recorder plus videos, and a variety of clothing. Sadly nothing of any historical interest was unearthed, but it was satisfying to see the ponds restored, not to their former glory, but into an interesting reminder of what they once used to be. Related blog post: Have You Seen The Stew Ponds? Nick’s Triumphant Return – nearly 500 miles in under two weeks!!! After excellent hospitality from my sister, Helen, and her husband, Paul, today I set off from Reading in fine weather helped by Paul, who cycled with me through the centre of Reading to get me to the cycle path going south. From then on it was quite an easy ride of 25 miles, making the total journey 487 miles. I arrived home just before one o’clock to be greeted by Margaret and some wellwishers from FPS. 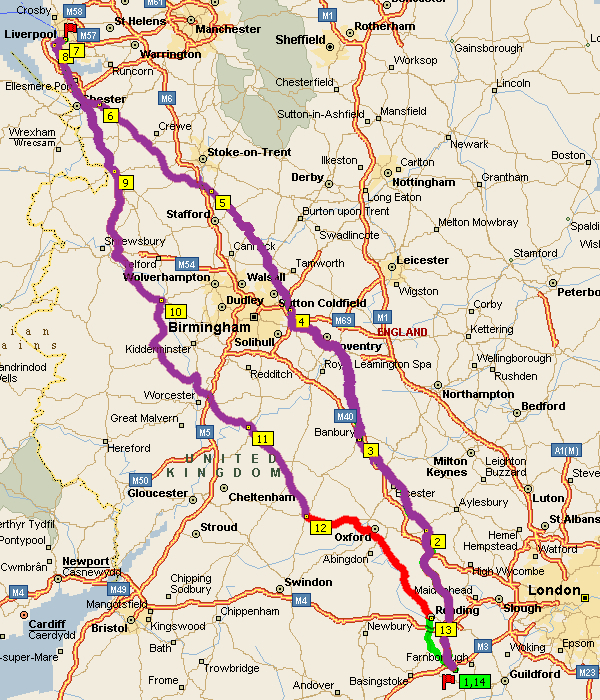 In general the journey to Liverpool was easier as I benefited from good weather and did not face too many head winds. Coming back was harder, especially on Wednesday, when head winds, driving rain and nasty Shropshire hills left me feeling a bit washed out. Far too many hills cluttered up the countryside. Someone should have tidied them away and moved them up north, where such hills belong. I would like to thank everyone who has sponsored me and those who have sent me messages of support either by text or through Facebook. This support has been very helpful, especially after a hard day. or send a cheque to Colin Gray, 14 Kenilworth Road, Fleet, GU51 3DA, payable to Fleet Pond Society. 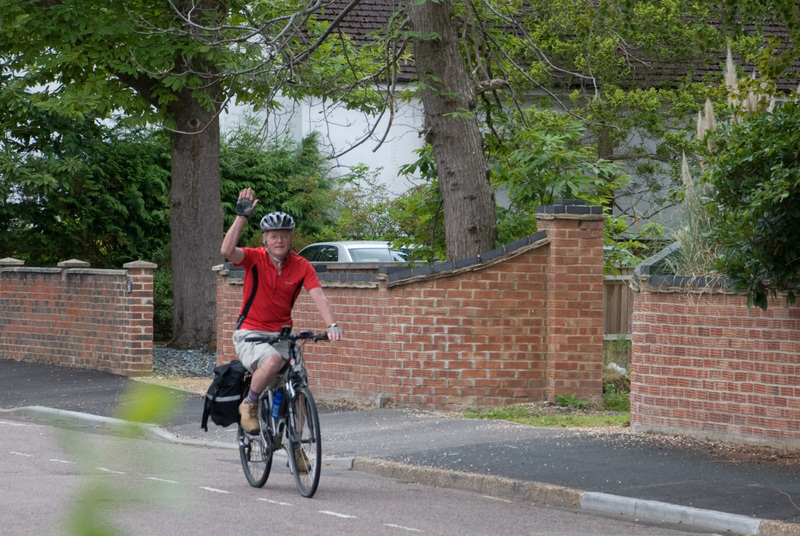 Nick’s Bike Ride – Day 12 – On the home straight! Friday, and 46 miles from Burford to Reading, making a total to date of 462 miles. After a lovely stay at the Wyck House Hotel, Margaret took me back to Burford so that I could resume the ride. After a bit of a climb out of Burford, the countryside for the first half of the ride was quite gentle, although the blustery winds were not. The highest point of the ride was near Harwell and after that I followed the main roads all the way to Reading. The views were quite spectacular although the intermittent hills were not welcome. I arrived at my sister’s at about 4 pm with only 22 miles left to go tomorrow. or by sending a cheque to Colin Gray, 14 Kenilworth Road, Fleet, GU51 3DA, payable to Fleet Pond Society. Your cheque will not be cashed until after the ride has been completed. 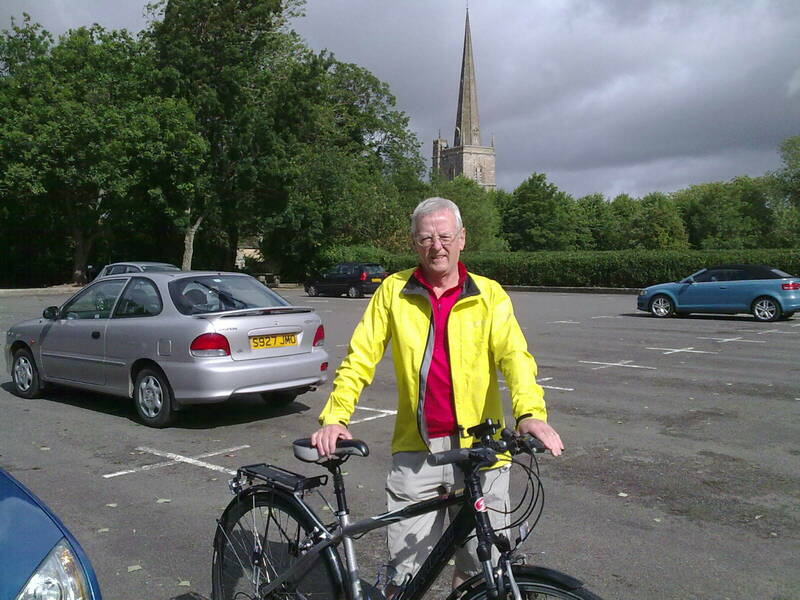 Nick’s Bike Ride – Day 11 – Burford and back! (Unfortunately, all hotels in Burford, Nick’s planned stop for tonight, are full due to the local Air Show. 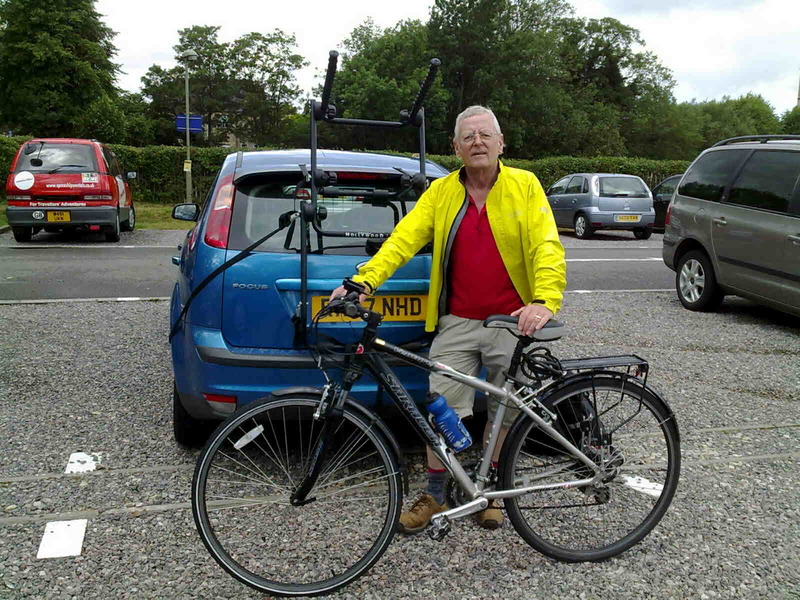 Nick’s wife, Margaret, is going to meet him in Burford and drive them to Stow for the night, then drop Nick and bike back in Burford on Friday morning). Sharyn requires proof of no cheating, so today’s photo is of me & bike in Burford this afternoon. Photo to come from same place on Friday! Evesham to Burford 28 miles – started with steepest and highest hill of the trip. Rain and very blustery winds, but not as hard as yesterday, as not always head-on. After climb, took the main road, where trees protected me from strong side winds. Long descent to Stow-on-the-Wold. Very wet, so pushed on up long hill past Wick Hill Hotel where Margaret and I will be staying tonight, then 9 miles to Burford. After nice pub lunch and a look around Burford Market, Margaret took me and bike to Wick Hill Hotel, Stow. She will drop me in Burford tomorrow, so no cheating! 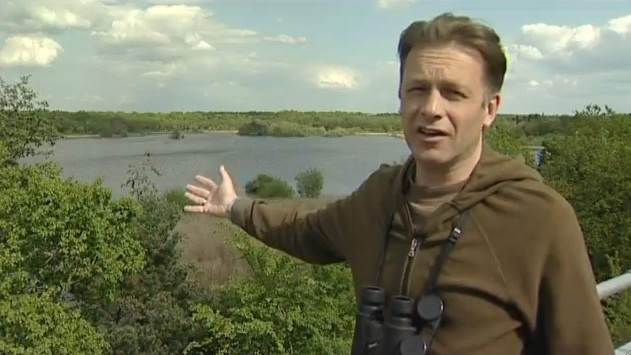 As promised in our earlier post, here is the video of wildlife presenter and Fleet Pond Society Patron, Chris Packham, exploring the history of the pond and describing why a major restoration programme has now become necessary. Chris takes a look at Fleet Pond and explains why the Fleet Pond Society has launched the Clearwater Campaign to raise funds and awareness of the serious issues that put the future of the pond in jeopardy. Further details on the making of the video can be found here. The blog has now had over 30,000 visits since it started in July 2008. Here at Fleet Pond Society, we’d like to say many grateful thanks to all our readers and contributors for keeping a sustained interest in the many activities that take place at Fleet Pond and for helping make the blog the success it’s become. We have some new and exciting ideas for the future, so please keep tuned! 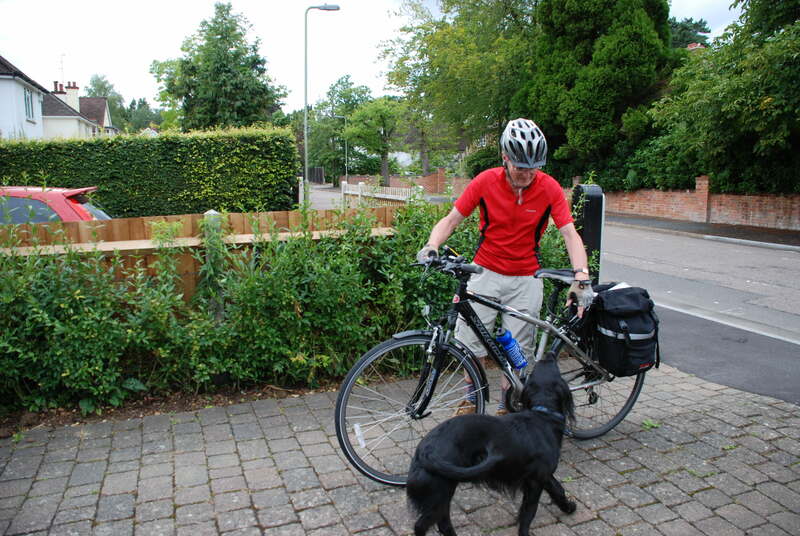 Nick’s Bike Ride – Day 10 – into Evesham with leaden legs! The red line shows the gruelling 47 miles Nick covered today – he still has another 3 days to go on this unsupported and self-funded journey! Today I cycled 47 miles from Bridgnorth to Evesham, making 388 miles in total so far. As I feared this was the worst day so far. I started with 11 miles of hills, rain and headwinds along a busy road. When I did escape on to side roads for a few miles the hills were even higher, but there were fine views from the ridge. By noon the hills were easier, the rain had stopped and the last 25 miles were on quiet roads. My legs were like lead and I struggled, with lots of stops and pushing. I’m staying at the The Northwick Hotel, a nice riverside hotel in Evesham. Many thanks to the committee members who have been out doing more leafleting today. You are currently browsing the Fleet Pond Blog blog archives for July, 2010.